The festive season is here and a lot of people are looking forward to the celebrations. It is the time when friends and relatives get together and have fun. Many people also leave their homes to go on holiday. Unfortunately, during this time there is a rise in burglaries at homes and businesses. Members of the police will continue to give up their own holidays to serve and protect South Africans. 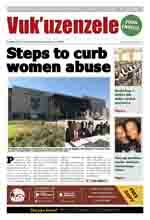 The South African Police Service (SAPS) will carry out crime prevention operations in all provinces. But they ask you, as a member of the community, to be patient and co-operate when you get to police roadblocks and vehicle checkpoints. Prevention of crime should be a joint effort between the police and the community. So, please be extra careful to ensure your own safety. 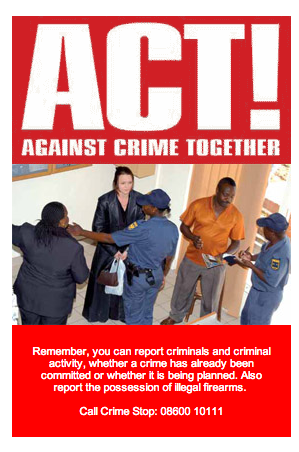 Taking the following simple steps can help to prevent you from becoming a victim of crime. Know the emergency numbers like the police and ambulance. Never leave keys in gates, doors or cars. When nearing your house ensure that it is safe to enter and that you have not been followed. Know your neighbours and build a relationship of trust and support. Never leave children alone. Always keep money in a safe place. Don't buy stolen goods. This motivates criminals to even steal more goods. Contact your nearest police station immediately. Wait until fingerprints and statements have been taken before touching anything. Unless it is absolutely necessary don't allow anyone to enter the house or touch anything before the police have investigated the scene. Keep a list of the make, model and serial numbers of electrical appliances for investigation purposes. Make sure that the doors and windows of your house are properly locked. Ask a trusted family member or relative to check your house every second day while you are away. Plan your route beforehand so that you don't get lost in remote or unsafe areas. Be careful before you stop people to ask for directions. Leave early so that you arrive at your destination before dark.